Specially formulated for Coach, this Leather Moisturizer extends the natural life and beauty of their exclusive leathers. Leather goods should be moisturized any time they are cleaned or otherwise show signs of dryness. 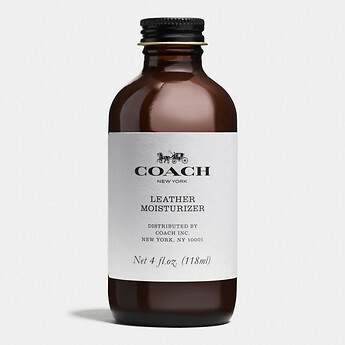 Coach Leather Moisturizer may be used on the following leathers: Crossgrain, Metallic Crossgrain, Metallic Pebble, Natural Calf, Pebble, Polished Pebble, Refined Calf, Signature Calf, Smooth Calf, Soft Calf, Sport Calf, Stamped/Glazed Crocodile, Stamped Snakeskin. Please DO NOT use Coach Leather Moisturizer on Glovetanned Leather, Calf Suede or Haircalf. For leathers not on this list, test in an inconspicuous spot and let dry for at least one hour to ensure no negative reaction before proceeding. Follow directions on bottle for usage.